Healthcare decision-making support tools for clinicians with access to more than 25,000+ medical calculators stored in a remote database. This vast collection of medical algorithms covers nearly every medical specialty. 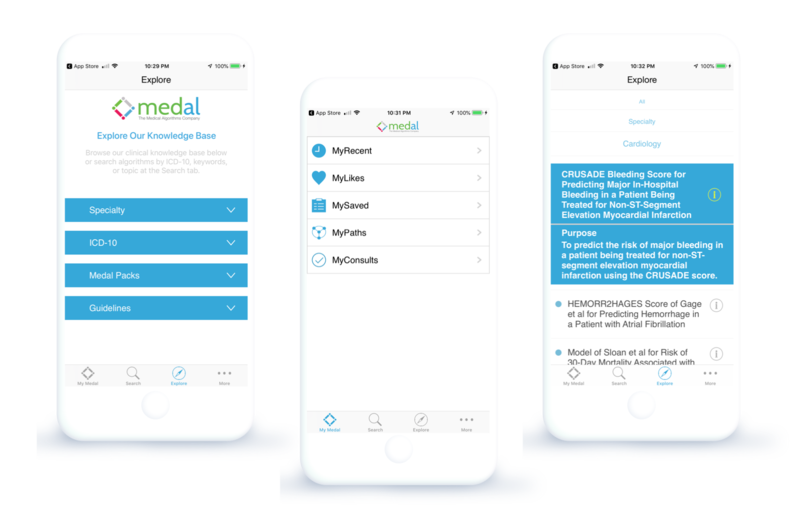 The apps enable clinicians to access powerful, effective, peer-review based clinical decision support tools — a must-have resource for healthcare professionals. The full collection includes analytics, covering diagnosis, therapy, and monitoring of health conditions along with many more clinical topics. The Expanded Apps team began developing this robust clinical decision-making platform in 2013 and has been supporting and maintaining it since then. Our team not only developed the complete front-end system, we also designed, built, and currently maintain the back-end database and administrative system which is used to manage, develop, review, and release new analytics by the Medal team of physicians and healthcare professionals.